The incidence of gingival enlargement is lower in patients who are taking cyclosporine compared to patients who are on phenytoin (Approximately 50 % of patients have gingival overgrowth). However, it can be very severe (covers the entire surface of teeth) when gingival enlargement occurs in patients who are taking cyclosporine. – Often affect the gingival on the labial (front) surface of the anterior teeth. 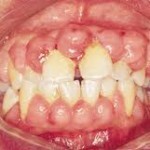 – Gingival swelling is pink, firm and lobulated especially in cyclosporine induced gingival enlargement. – Gingival swelling is made up mainly of fibrous tissue. – Gingival swelling can become soft, inflamed, when provoked especially by dental plaque. – Gingival enlargement tends to be more severe in areas where plaque accumulates such as at the edge of dental fillings and around your orthodontic appliance. – In severe condition, gingival hyperplasia can cover the entire surface of your teeth. The enlargement can even extend into your gingival sulcus. – Size of swelling does not appear to be related to the dosage of the drug. Treatment and management of drug induced gingival hyperplasia. 2. Change of drug. Discuss with your physician whether it is possible to reduce the dosage of the drug or change to another alternative drug. Thus it is important that you inform the dentist regarding any drugs that you are taking so that he can identify the cause of your gingival overgrowth. If changing of drug is not possible, the dental practitioner should inform his/her patient about it and the only treatment available for you is to maintain good oral hygiene and undergo professional scaling treatment to minimize plaque accumulation. 3. Local removal of gingival overgrowth can be carried out by periodontal surgery procedures such as gingivectomy. 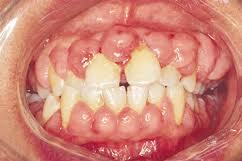 However, recurrence of gingival overgrowth (reduce by maintenance of good oral hygiene) is very common after surgery. 4. Here are some brief explanations of how gingivectomy is performed. 1. The periodontal specialist will mark the apical limit of your periodontal pocket (the deepest part of your periodontal pocket) by using a special instrument. – Inform the dental specialist if you are experiencing any extensive pain, swelling or bleeding.